Once again, my thanks. 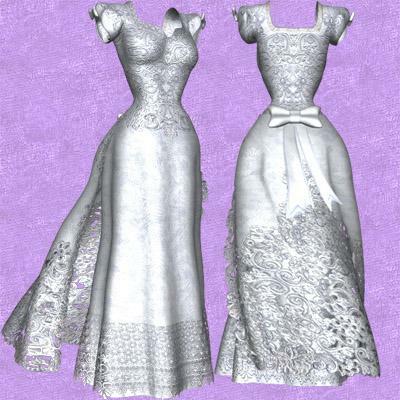 These textures are excellent not just for late 1800's/early 1900's wedding dresses, but also for court presentation gowns, debutante gowns and any other occasions where white is appropriate. Nathraiben (9 years ago) Inappropriate? If I ever had the funny idea of getting married, it would surely be in THIS dress! Dearest thanks to you and Jan19 for all the beautiful clothes the two of you are sharing with us. I've got the whole bunch over the last few days and I'm eagerly waiting for an occasion to use them.